First job on the list? A new open plan kitchen diner. Find out how they did it – and then see all our real home transformations and extensions. 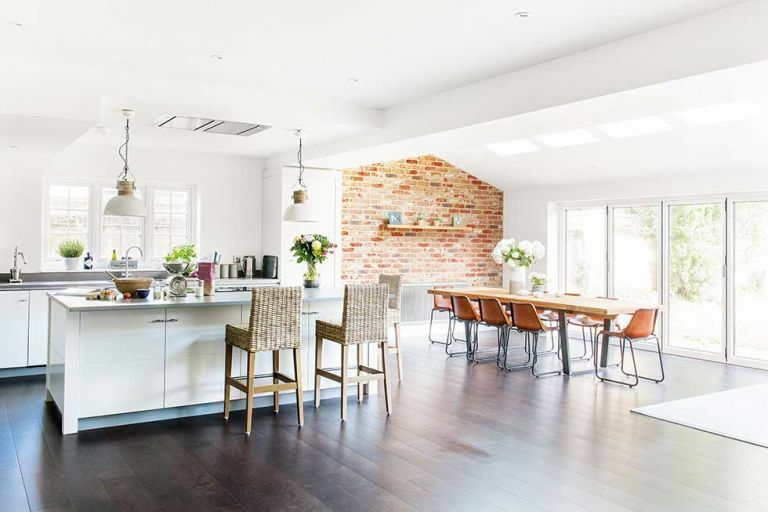 The decision was made to knock through the existing kitchen, breakfast room and utility, and then add a single storey extension into the garden by almost 4m – a loss of outside space that the family was happy to compromise on. Mark had to convince Amanda that they should include a kitchen island, as she originally wanted more clear space, but she now finds it offers invaluable storage. ‘Even though the kitchen was going to be a key part of the space, I didn’t want too much clutter and I had to resist the temptation to have lots of cupboards and worktops. I also wanted a lot of clear space,’ explains Amanda. Amanda invested in furniture with a reclaimed look to give the new extension an industrial edge. All of the walls are painted white, which emphasises the portraits Amanda took of her children. Knocking together the existing kitchen and dining room and adding a four-metre rear extension created the ‘huge’ space Amanda craved. It was created to look seamless from the outside, with its cream rendering and pitched roof, angled and tiled to mimic the original building. The full feature – including stockists and more images – appears in the March 2016 issue of Real Homes. Subscribe today to take advantage of our money-saving subscription offers.